Large flocks of 30 robins are common in backyards this time of year. Robins are considered short-term migrants. They will move for short distances to find food and shelter. The Audubon Christmas Bird Count reports from 700 to 1300 American Robins each year in our area. During the winter, robins will eat mealworms, raisins and some forms of suet. Sometimes they will even eat seed, if hungry enough, particularly sunflower chips this time of year. The male American Robins have a dark gray to almost black back and tail with a rust/brick colored breast. The female is paler all over. The juvenile robins have a spotted breast. Robins are attracted to open lawns and gardens with mature shrubbery and trees. In summer, they eat a variety of insects and berries. It has been noted that robins can eat up to 14 feet of earthworms in a day! 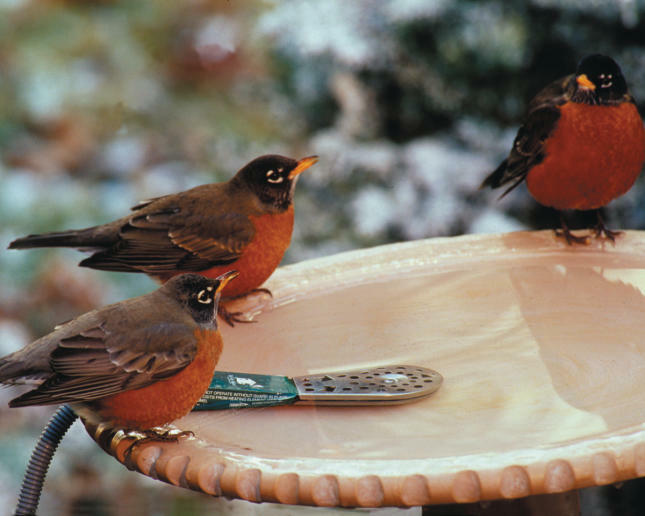 Robins can be attracted to a feeding station by offering mealworms, fruit and a birdbath. It’s especially fun to offer mealworms during nesting season when the robins can stop and pick up a mouthful of tasty worms to take back to their babies. Robins live on average about one-and a half years, but can live up to five years. They typically nest April through May and can have two to three broods in a season. The female does most of the nest building. It typically takes about five to six days to build the nest. Robins lay about four eggs and the female incubates the eggs for 12-14 days. Both parents guard the nest from danger. The babies are fully feathered in about 10 days and leave the nest in 14-16 days. Happy Birdfeeding!